PRAGUE, Czech Republic (AP) — Rolling Stones fans hoping for a glimpse of Mick Jagger's 60th birthday bash in Prague this weekend are finding they can't always get what they want. The Stones' frontman celebrates his birthday on Saturday at a party that by all accounts is a very private affair in the Czech capital, where the Stones play a concert Sunday as part of their "Forty Licks" tour. The venue is Prague's most closely guarded secret, keeping the paparazzi on their feet. Local media have speculated that Jagger will celebrate at the British Embassy in Prague's Thun Palace or at the Four Seasons Hotel. Even former President Vaclav Havel, a friend of Jagger's and an invited guest, said he doesn't know where the festivities will be held. "We will be told at the last minute," said Havel's aide, Martin Vidlak. "This is a private party under full control of Mick Jagger." Sir Mick is the second in the band to turn 60. Drummer Charlie Watts marked that milestones, and Keith Richards celebrates his 60th in December. 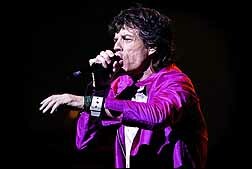 Jagger has a soft spot for Prague, where the Stones are making their fourth appearance in the past 13 years. Sunday's concert is taking place at Letna Park on a hill overlooking central Prague. Shortly after Havel completed his anti-communist Velvet Revolution in 1989, Jagger took his "Steel Wheels" tour to Prague. "The tanks are rolling out, the Stones are rolling in," the posters said, hinting at the end of Russian occupation of what was then Czechoslovakia. The band, which was arriving Friday from Hamburg, Germany, has even donated part of its light system to illuminate the city's landmark Prague Castle. According to unofficial reports, the Stones were expected to walk across the famed medieval Charles Bridge on Saturday and view an exhibition of paintings by Stones guitarist Ron Wood which opened in Prague earlier this week. A brief meeting with Havel also was scheduled. Although the party venue remains a virtual state secret, word of Havel's birthday present to Jagger has been leaked to the press: a two-foot-high crystal vase by Havel's favorite artist, Borek Sipek. The Blesk newspaper, which published a photo of the vase, said it was intended to embody Jagger's "far-flung image — and perhaps even his soul, torn to pieces."